★ Easy to use — Super simple design that makes the whole fermentation process much easier for both starters and enthusiasts. ★ Automatic venting — No need to burp jars daily to release excess pressure and maintain water levels. 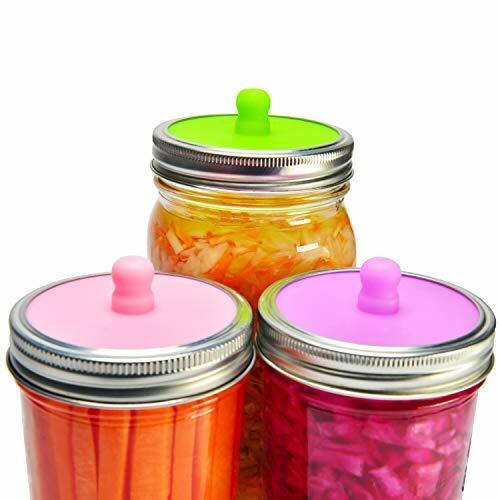 ★ Mold Free — Cover the jar with a fermenting airlock lid reducing the risk of mold without any daily maintenance. ★ Fits Any Wide Mouth Mason Jar — With a size of 3.35’’ diam , each lid is perfectly suitable for all wide mouth mason jars. ★ Easy to Clean & Store — They are also convenient for both dishwasher cleaning and hand washing.